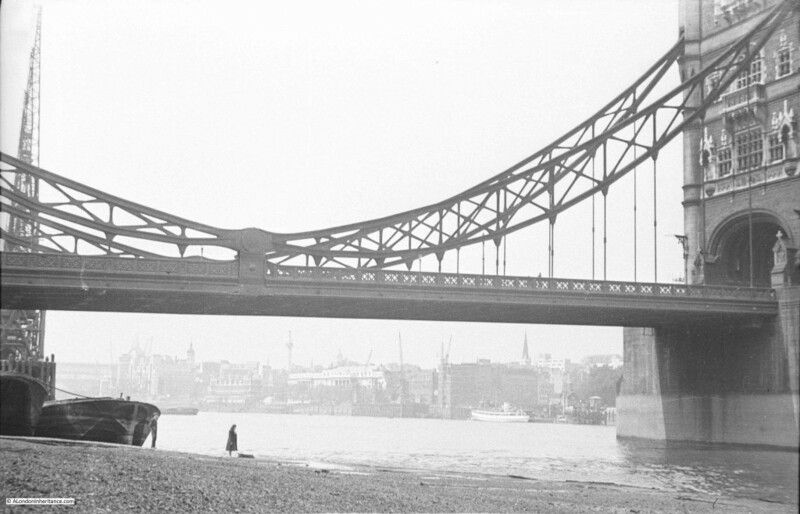 On a Sunday morning in 1947, my father is taking photos along the south bank of the River Thames, in the region of Tower Bridge. 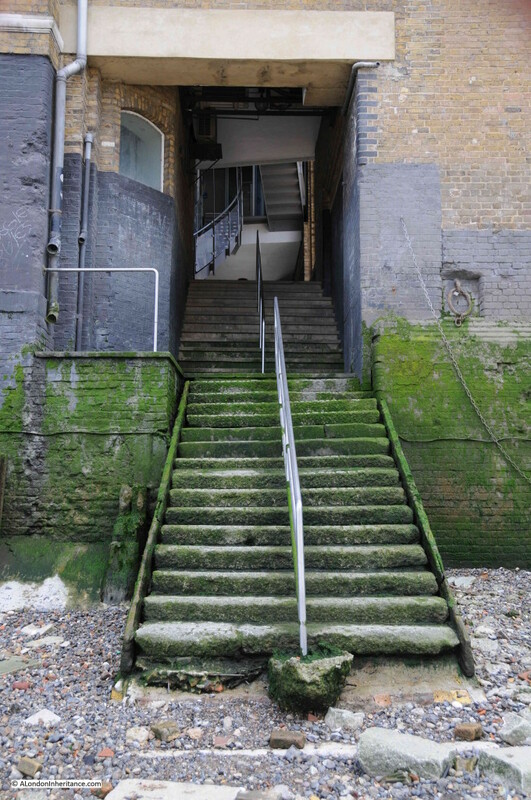 I have already covered Pickle Herring Street in a previous post, and for this week, we have walked under Tower Bridge, a short distance along Shad Thames to the area around Horselydown Old Stairs. 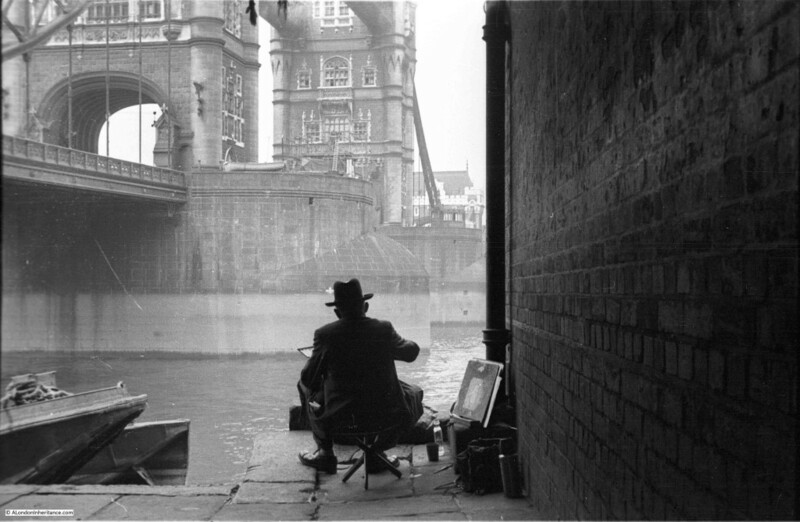 If we look to the left, just before reaching the stairs, there is a man sitting on a low stool and painting a view that must have been painted, drawn and photographed many thousands of times since Tower Bridge was completed. 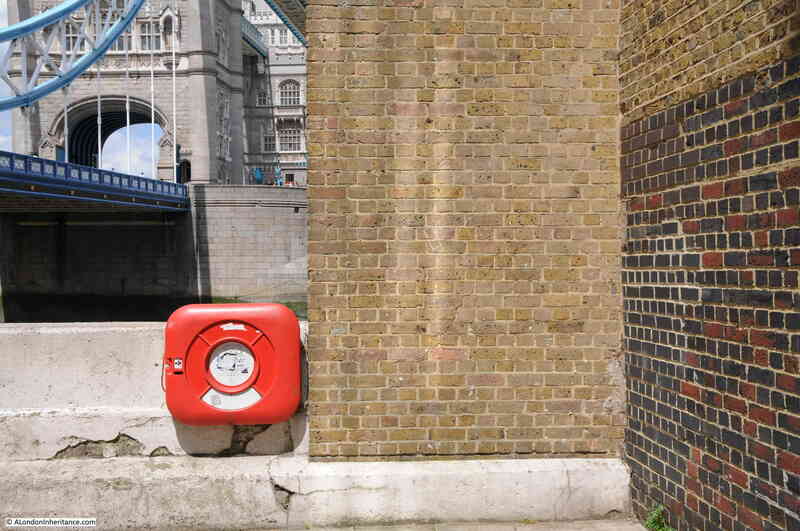 The site is adjacent to the old Anchor Brewery building and finding the spot was easy, however where the artist sat in 1947 is now blocked by a wall that obscures the view to Tower Bridge and the river. My 2015 photo is below. My father’s photo was taken from much closer to the wall, however if I took the same position most of the view is obscured by the wall, but it is close enough. The Anchor Brewery building was restored in the late 1980s so I assume it was then that this new wall was built and when the brickwork on the right was cleaned. Horselydown Old Stairs are just to the right of the brick wall and are one of the oldest remaining stairs providing access to the river along the Thames. If you look just to the right of Tower Bridge on the southern bank of the Thames in the following map from the 1940 Bartholomew Atlas of London, the position of Horselydown Old Stairs is clearly marked. 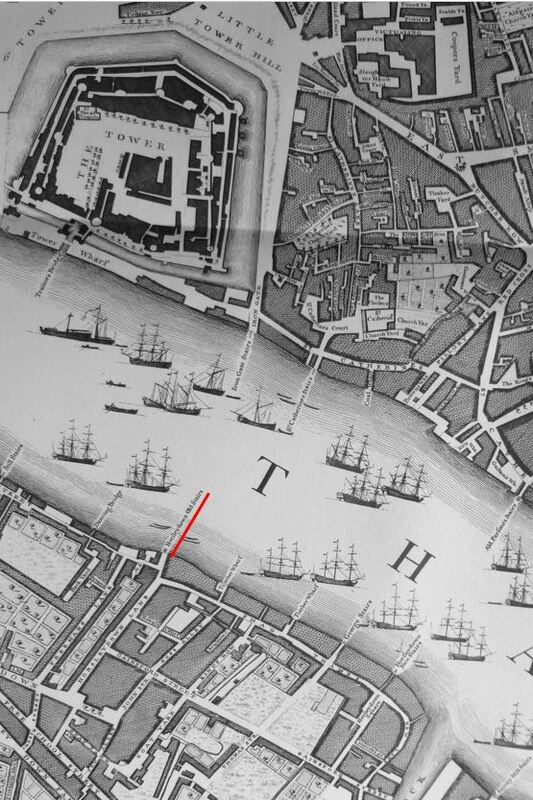 To show the antiquity of these stairs, John Rocque’s survey of London from 1746 shows the same area long before Tower Bridge was built, but still shows Horselydown Old Stairs in the same position (underlined in red). 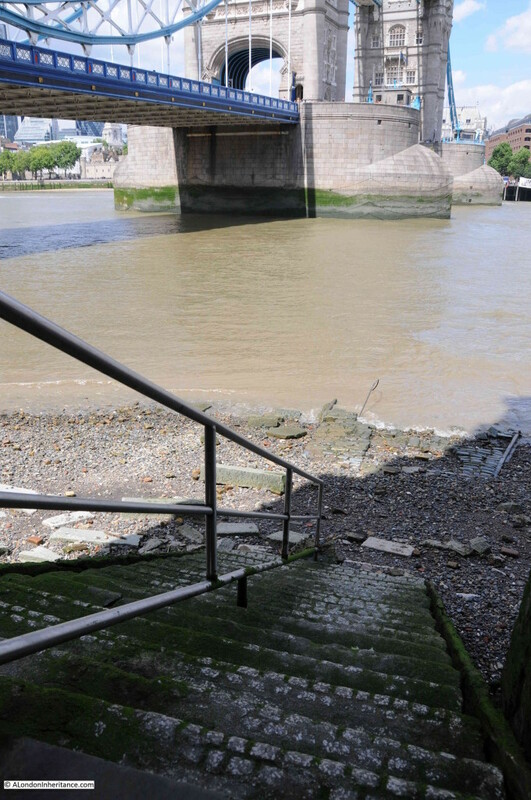 When the Thames was a working river, there were many stairs providing access to the river along both the north and south banks. Roque’s map demonstrates how many there were in this short stretch of the Thames. The map also illustrates the amount of shipping along the Thames and the stairs were used by those who worked the river and took smaller boats out to the larger moored ships etc. Horselydown Old Stairs are one of the few that remain to provide full access from street level down to the river. Horselydown was the area roughly from Tooley Street, down to the river and along to St. Saviours Dock. The name Horselydown is from “the district of Horsey-down, Horsa-down or Horsley-down, so called from its having been used by the inhabitants as a grazing field for their horses and cattle”. Two Horselydown stairs were close to the two ends of the area on the river. Follow the bank of the Thames east from Horselydown Old Stairs and we find two Timber Wharf’s, George Stairs and finally Horselydown New Stairs. 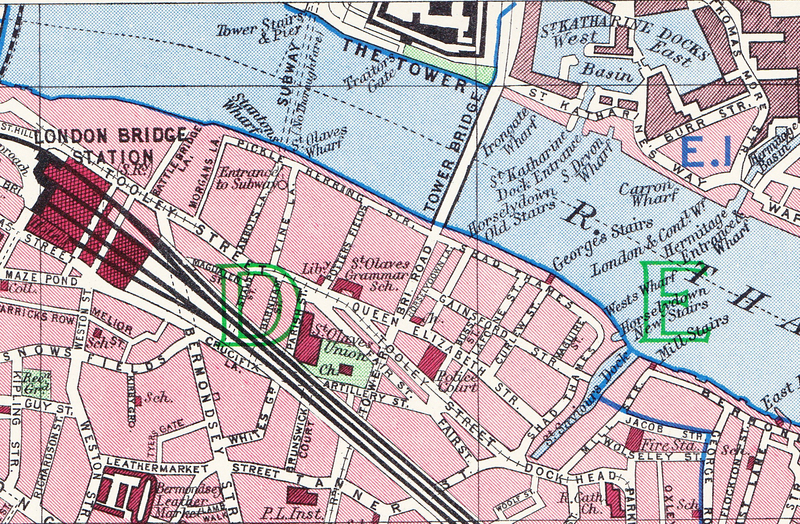 The above 1940 map extract shows the boundaries of Horselydown well with Tooley Street to the south, Horselydown is the area up to the river. The fact that there is an old and new stairs in 1746 hints at the antiquity of the old stairs. Indeed Edward Walford’s Old and New London states that “from the corner of Bermondsey Street to Horselydown was formerly called Horselydown Lane; and here, on the west side of Stoney Lane; which was once a Roman road leading to the trajectus, or ferry over the river to the Tower.” Perhaps in the area of the stairs? Note also that there is a difference in spelling between the 1940 and 1746 maps. In 1746 the spelling is Horsleydown with the spelling of Horselydown used in 1940 (just a swap of position for the l and e). 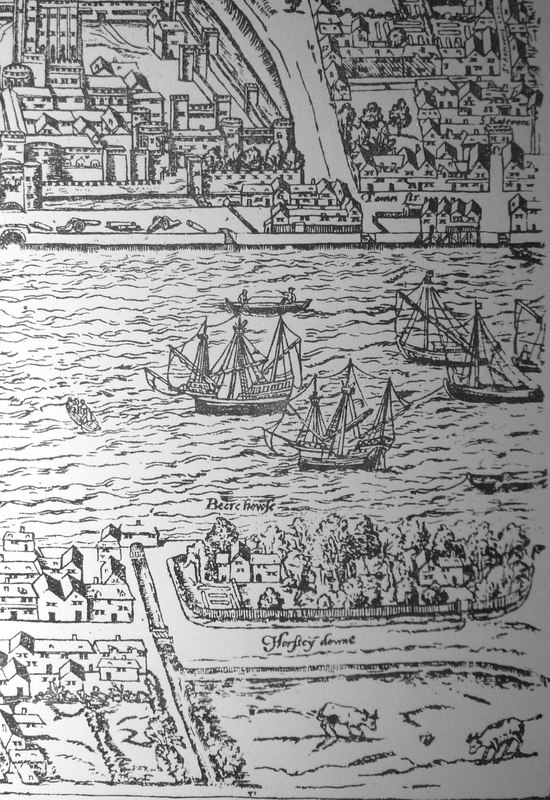 Horselydown makes an appearance in Ralph Agas map of London published around 1591. The fenced off area close to the river were originally the manor house, mill and brew house of the prior of the Hospital of St. John of Jerusalem. also known as the Liberty of St. John of Jerusalem. 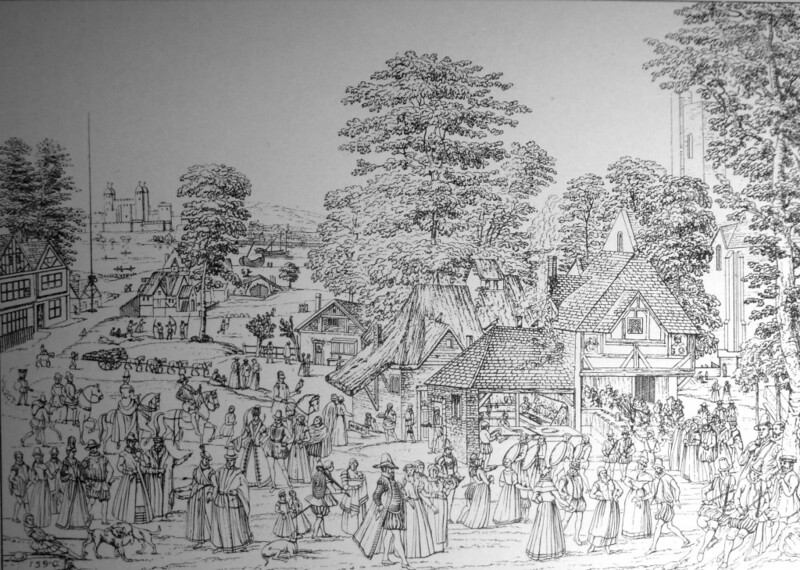 In the reign of Edward 1st, this consisted of three water-mills, three acres of land, one acre of meadow, and twenty acres of pasture. The stars are entered through the old Anchor Brewery building, and drop straight down to the river. Fortunately the tide was out during my visit so I could get down to the foreshore. The lower level of the stairs run out from the building down to the foreshore. Note the remains of the paved surface leading from the bottom of the stairs out into the river. My father took the same route in 1947 and from the steps took the following photo. 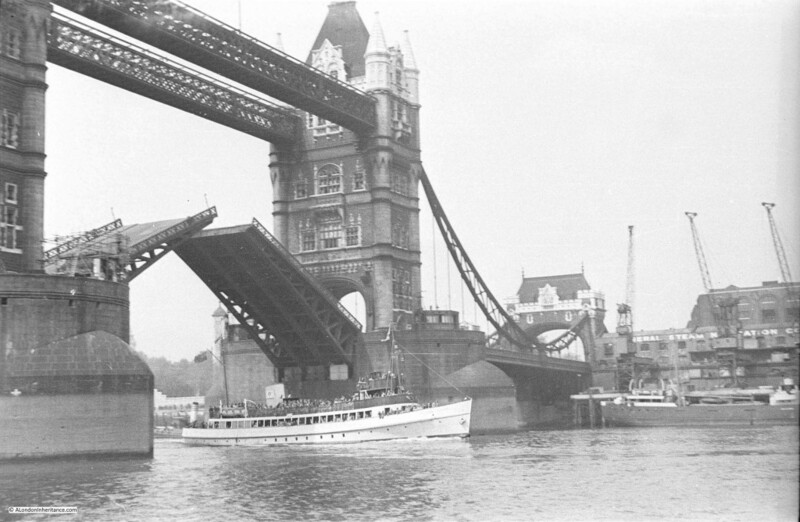 Tower bridge has opened to allow a ship to pass. 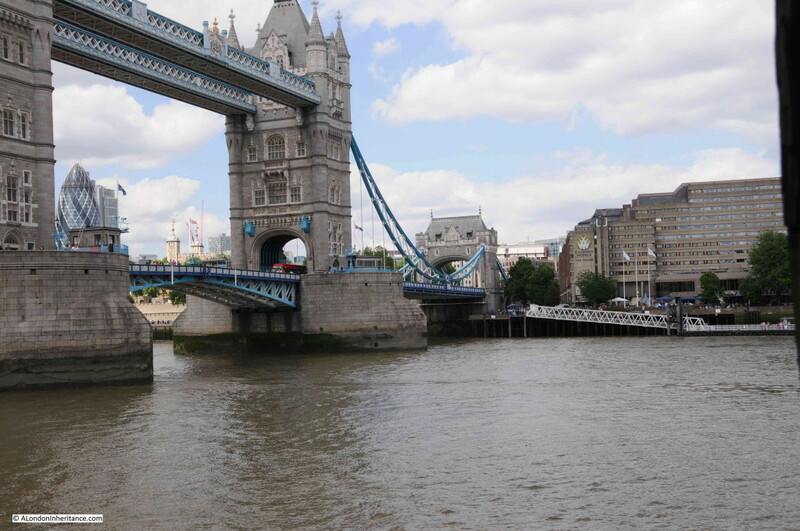 Part of the Tower of London can just be seen to the left of the bridge and to the right is the General Steam Navigation Company (GSN). The General Steam Navigation Company was formed in 1821 by a group of London businessmen and the name came into use in 1824 when a joint stock company was formed. GSN was active in trade around the UK coast and to the near European coast. It also ran a pleasure ship business taking Londoners down river to locations such as Southend, Clacton and Margate. After the first world war the company was taken over by P&O and ran almost as an independent business, but after the second world war, trade and pleasure shipping was changing rapidly. GSN was integrated into the cross-channel ferry business, the pleasure sailings closed and the name finally disappeared in the early 1970s when GSN was fully integrated into P&O. A close up of the ship passing underneath Tower Bridge. It is full of passengers, perhaps taking a Sunday excursion to Greenwich or perhaps more likely as far down the Thames as Southend or Margate. My 2015 photo from Horseleydown Old Stairs. Unfortunately I did not have the same luck with the bridge opening. The site of the General Steam Navigation Company is now occupied by the Tower Hotel. 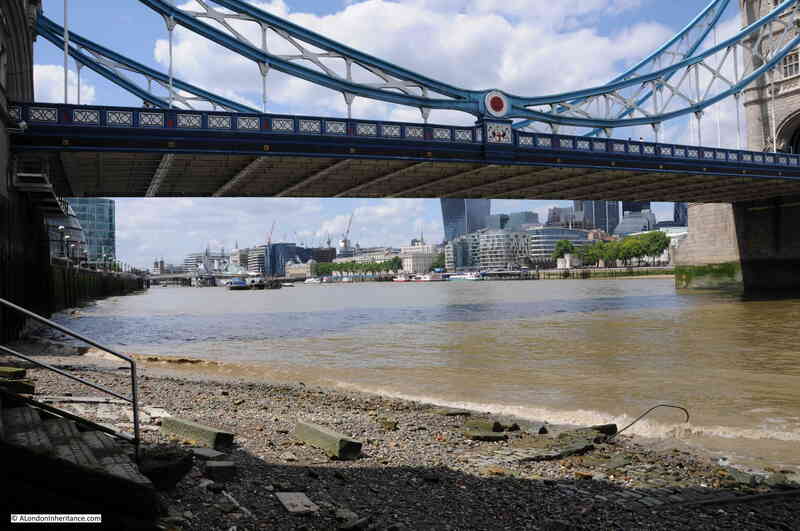 The foreshore at Horselydown Old Stairs is a great place to view Tower Bridge and the river. 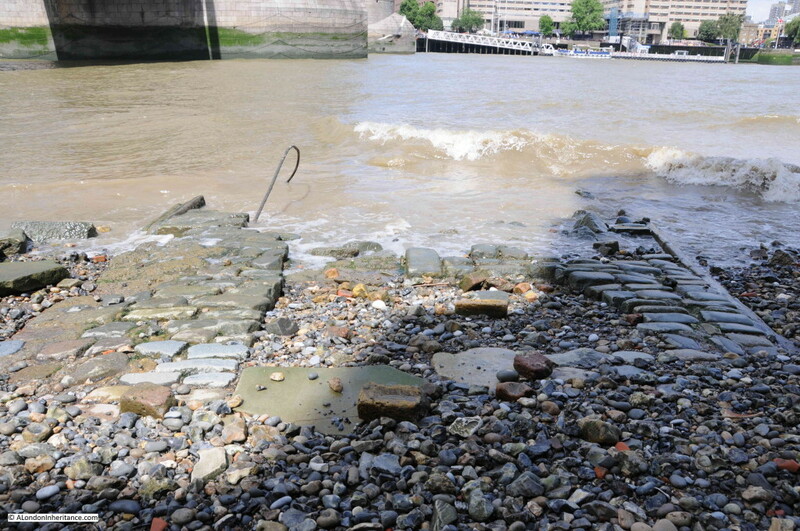 I also find it fascinating to leave behind the “redeveloped streets” that now run along much of the south bank of the Thames and look at the mass of old bricks and stone work on the foreshore, probably from the many old buildings that once lined the Thames and that are now being slowly eroded by the continuous cycle of tides. 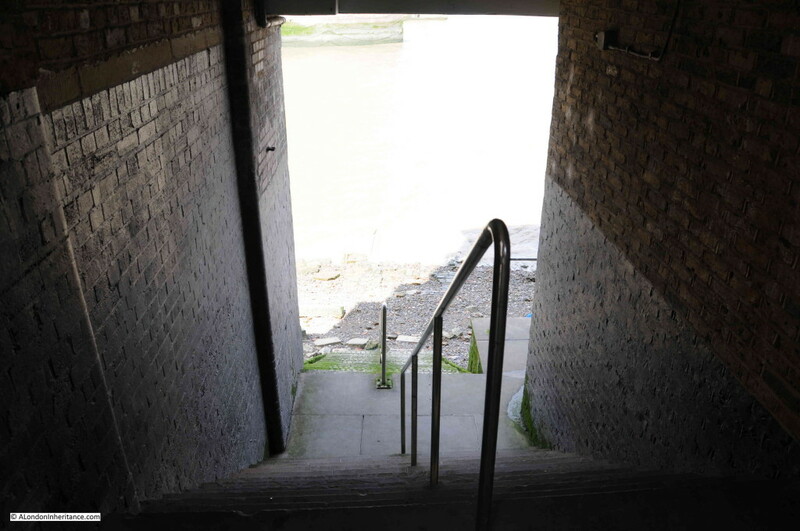 I walked down Horselydown Old Stairs on a busy Saturday afternoon from a very busy Shad Thames, however for the 20 minutes I was on the foreshore there was only one other group of 4 people who came down to admire the view of the bridge and river. In 1947 the foreshore was also very quiet. This photo looking underneath the bridge to the City has only two other people. A woman by the water’s edge and a man just by the barge. Note the cranes on the left. These ran along the warehouses that faced onto Pickle Herring Street. The tide is further out in my father’s photo and you can see in front of the barge the raised edge of the paved section running down to the river. Looking down at the remains of the paved walkway down into the Thames. And back up to the stairs leading through the old Anchor Brewery. The green algae shows the height of the tides. At the top of the stairs I found “Rehan’s painting spot” chalked on the wall. No idea who Rehan may be, but I was pleased to find a link back to the artist in my father’s 1947 photo. I walked across Tower Bridge and along the north bank of the river to look at the old Anchor Brewery building and the stairs. The following photo shows the brewery from the position of the General Steam Navigation Company and shows the stairs to the lower right. The wall which I assume was built as part of the redevelopment of this area can be seen as a small 3 tiered wall up against the right hand wall of the brewery. It is clearly not original as it does not have any of the architectural features of the main building. The 1947 artist was sitting at the base of this wall. A close up view of the stairs. Fascinating to consider how many people have taken these stairs over the centuries to cross the Thames or to reach shipping on the river. I went looking for the location of the artist and the stairs leading down to the Thames foreshore, but found Horselydown. There is much more to this area than I can cover in a weekly post and delving into the history of these areas also shows me how much I still have to learn of this fascinating city. 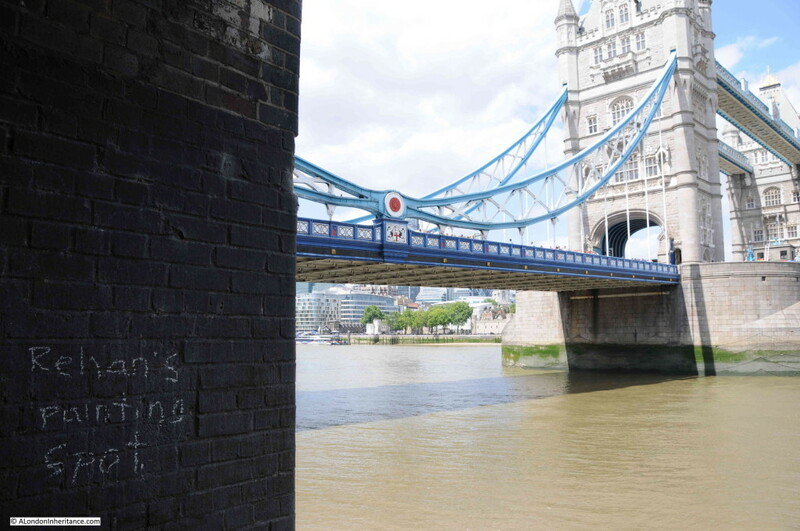 This entry was posted in The Thames and tagged Artist, Horselydown, River Thames, Tower Bridge on July 19, 2015 by admin. I really enjoyed this piece – a very evocative photo of the painter at the start. Most people in this area, since Tower Bridge was built, are drawn to look, photograph, or paint the bridge. You have turned it around and shown us the far more ancient Horselydown Stairs. If only the stairs could speak, the tales they would tell! The photo of the pleasure ship sailing down river brought back memories of a trip taken in the early 1960’s by pleasure steamer from the Tower to Southend pier. Do they still run them? Thanks for another interesting Sunday moorning. Hi Donna, thanks as always for your feedback, really appreciated. The furthest you can get on the passenger craft on the Thames today is down to Greenwich, although there are occasional special trips, for example the paddle ship Waverley is running a series of trips from Tower Pier to the Thames estuary towns in I believe September / October this year. Excellent blog as ever,Admin. I know this area well,being a Bermondsey girl. It was more interesting before the ‘gentrification’. 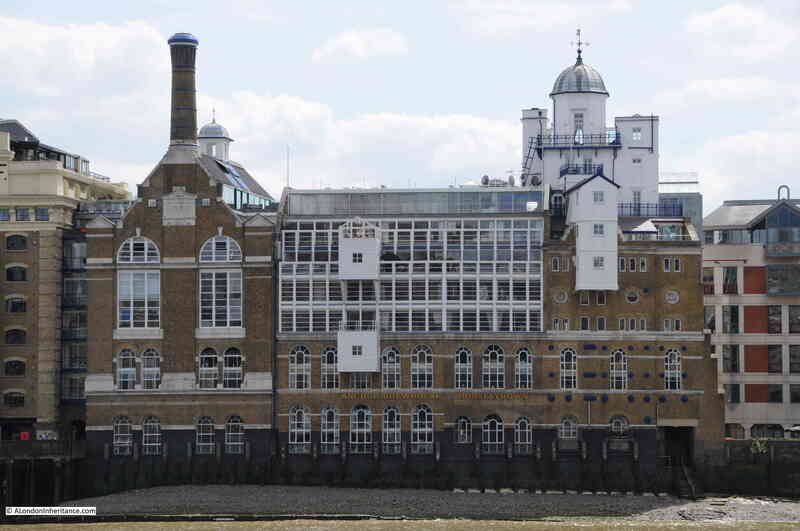 The smells from the brewery mixing with the other aromas from Sarson’s vinegar brewery along Tower Bridge Road made an assault on the nose,together with many,many other manufacturing odours; the tanning industry for example. By the way,I hope you had time to pop into the Anchor Tap, the original pub attached to the brewery. It has been kept almost as it was. Another absorbing and well researched journey into history! The old stone and brickwork around the steps and foreshore, along with all the old ironwork (which has escaped the attention of redevelopers) are indeed fascinating to see. Maybe you could treat us to a future photo selection of these interesting old structural details…? Thank you for creating all these excellent posts. Thanks Nigel. Yes, the small architectural features are fascinating and despite so much redevelopment there are still many to find if you spend the time looking. It is what makes walking such a pleasure. Thanks for another fine article with excellent photos…the area of the foreshore is very good for mudlarking…I have found several medieval pot sherds there! I stumbled across your blog in looking for the Horsleydown stairs. My forebears lived in Horsleydown Lane (which seems to still exist) in the 1840s before migrating to Australia in the 1850s-60s. They were lightermen and cornmeters. I would love to walk down those stairs. Maybe a trip next year. Thanks so much for the info and photos-love your Dad’s old photos. What stories those stairs could tell! I came across your blog by chance, while looking for further information about places in Horselydown, and was absolutely fascinated. From Horselydown Old Stairs, I moved on to Pickle Herring Street, and found it to be equally good. My husband’s ancestors, the Howards and Abbotts were lightermen and watermen in the Horselydown area in the 19th century, living in the neighbourhood of New Lane; maybe they used those very stairs. some of the earlier Abbotts were shipwrights, but as they pre-date census records, I do not know where their premises were. I shall watch with interest for any future blogs from you. Anne, thanks for the comments on the blog, really appreciated. Interesting that you have family ancestors from the area. It always fascinates me to think of the number of Londoners who must have walked in the same place, whether the steps to the river, the streets etc. The concrete wall to the right of the Anchor Brewhouse is (I think) part of the interim bank raising which was done in the 1970s to provide some protection against surge tides pending the completion of the Thames Barrier. I will have a look next time I am there. Here is a sketch by my grandfather Ted Bennett. Peter, thanks for the link to the sketch from Horsleydown Stairs. It really highlights the river traffic as that area of the Thames was so busy. It must be lovely to have such a collection of sketch books. Were they all scenes from London? I really enjoyed reading this, thank you. It’s particularly lovely to see your father’s photographs and the old maps showing how the area has changed. My mum has recently been doing some digging into our family history, and has traced one line back to someone who ran the Anchor Tap pub on Horseleydown Lane in the early 1830s – 40s. His son (my 3x great grandfather) became an apprentice waterman in the 1840s, so is very likely to have launched his boat from the Horseleydown Old Stairs. I like seeing the contrast between the area as they would have known it, and what is there now, and it would have been a very different place, and yet it is still possible to get a glimpse of how it might have been. The Anchor Brewery building was put up around the 1880s, and of course Tower Bridge wasn’t built until then either, so neither would have been there when our ancestor had the pub. Have been researching family trees for several years now. My partner’s 3rd grandad – a George Brockelbank lived in Horsleydown Lane in the the early 1800s – he was a Lighterman all his life and probably used the Anchor Tap pub as well. In the 1841 census, his daughter, Lucretia Brockelbank, was living with her sister and brother-in-law who was a Waterman in a place called Crown Court in or near Horsleydown Lane and have been trying to find out about ‘Crown Court’ – was it just the name of an area in Horsleydown Lane? The OS map for 1879 shows Boss Alley off Boss Street but Crown Court isn’t marked or identifiable. Maybe replaced by the Anchor Brewery? My husband and I did a walk round the area today and walked down the old stairs! Would love to chat with you re family of Brockelbanks but dont know the best way, perhaps via email. Aha I recognise your name from Ancestry!! Delighted to find this. I have recently discovered that my 3 times Great Grandfather lived at 31 Horselydown Street in the late 18th century. This information provides a fascinating appreciation of what life must have been like. Wonderful and so fascinating to read your blog and see the old and new photographs. I recently discovered my great grandmother was born in Thornton Street which is no longer there but it was near Shad Thames and Dockhead. Tooley Street towards to Shad Thames end is now where it once was. I couldn’t find any photographs but lot’s are online from Dockhead. It’s lovely to imagine my Great Grandmother was a Bermondsey gurl :-). Other members (Backhouse’s) ran passenger steam boats out of Hull to London which is making the River Thames extra special to me. I used to work at Blackfriars and walked across many of the bridges over the years without a clue. And to for me and my parents to have lived in Watermen Square in Penge for nearly 30 years without realising such a strong link to the river. Mindblowing. Thank you for all the time and effort to share this. Really appreciate it. Super interesting! Thank you for sharing this! Fascinating post – A Charles Abbott ‘ Lighterman of Horsleydown’ is buried in Brockely( formerly Deptford ) cemetery -so assume that he would have frequented the area & perhaps has an interesting story yet to be told? I wonder if Brockley was named after the Brockelbank family? The Brockelbanks being famous in the area of Horsleydown. In the early ’80s on the way back from a well known pub in the area we saw this little box moving and as we slowed down we discovered a little puppy inside. We name him Brockley but couldn’t – unfortunately – keep him as we already had two doggies. Took him to BDHome and he found a lovely family. I thoroughly enjoyed reading and looking at everything here. I have been trying to find out about a place called Crown Court in Horsleydown. It’s in the 1841 census near to Horsleydown Place. Lucretia Brockelbank (1819-1903) was my partner’s great-great grandma on paternal side and she was living there with her sister and brother-in-law, who was a Waterman, in 1841. Lucretia’s father’s brother was Thomas Brockelbank (1774-1843) who became the Managing Director of the General Steam Navigation Company and a very wealthy man. Although I don’t think much of it ever came to Lucretia for whatever reason. Lucretia’s father George Brockelbank was a Lighterman as was his brother Thomas in his early years . Their father was John Brockelbank – A Customs Officer. I really want to find out what sort of environment Lucretia lived in the 1840s and her early twenties. I do hope someone out there might be able to help. I love these sites. Take care and thanks to everyone. Like a lot of people these days I research my family tree. Now my great grandmother had an official husband and an unofficial husband a Mr Henry G Dukes. Mr Dukes worked as a Lamplighter, etc on Tower Bridge. He died in 1919 and when I received his death certificate the section which indicates ‘When and Where Died’ is given as River Thames Off Horslydown Stairs. It appears he drowned. This piece of information brought me to this website/page and it was interesting to learn some of the history of this part of London. Working near Tower Bridge, I’ve made a few of my own discoveries of the Thames stairs leading down to the River, taking almost identical photos to the various blog postings. It’s been wonderful to get such in depth history and background to how these stairs were used in close proximity to the Tower of London, either side and over the Bridge. 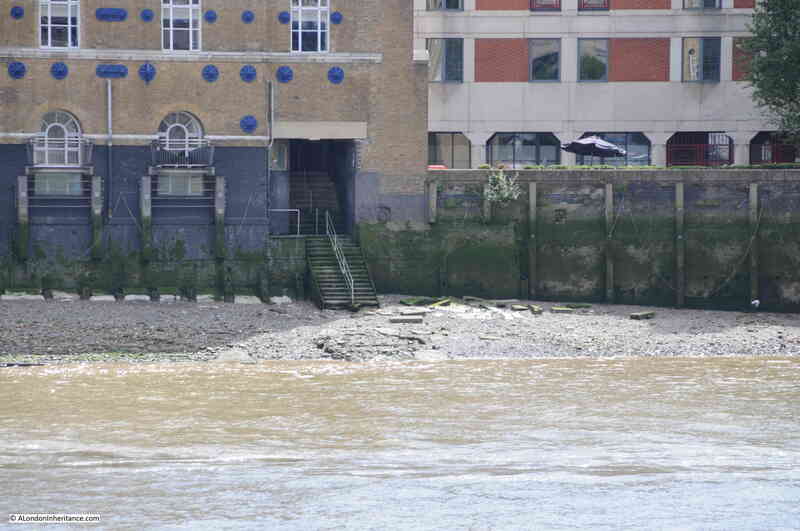 I think a blog of Thames stairs would be a great project, but that’s me being selfish!